What do you get when you put six boys in a room with sharp knives? Why, apple pie, of course! Cameron spent the week attending The Hill School’s inaugural Cooking Camp, hosted by parent Emily Tyler and teacher Christie Roberts. Several of Cameron’s classmates and pals joined him for five days of cooking, eating and swimming, including Jack (left) and Tug (center). I spent the morning attending camp, shooting photos and lending a helping hand when needed. 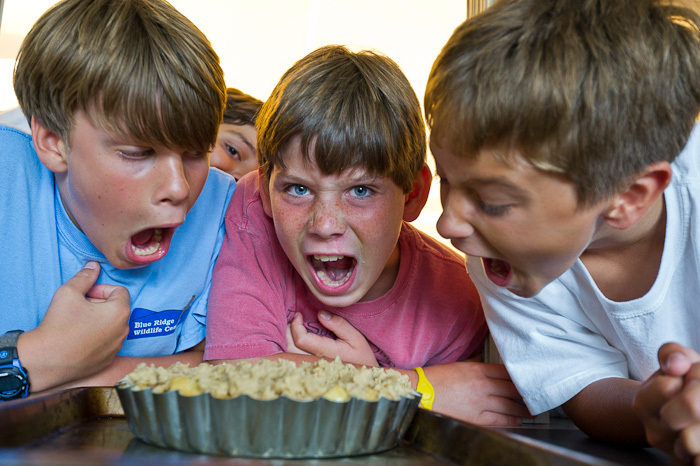 With a dozen campers ages 9-12 making apple and peach pies and pizzas, there were plenty of doughy photo ops. Although it was difficult to choose today’s featured image, this one spoke volumes. You see, it’s amazing this pie even made it to the oven. It seemed that as fast as they prepared the ingredients, the apple slices disappeared into hungry mouths. In the end, the pie turned out great, although I’m taking Cam’s word. There were no leftovers to bring home to the photographer. What fun–and what a great focus for a camp for kids. As usual, thanks for sharing!